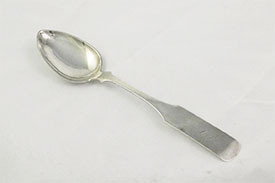 Old South Silver is the website of Jerome Redfearn, specialist in antique silver from the south and mid-west. This site is the culmination of more than thirty years of Jerome's collecting, dealing in, and writing on this subject. Since 1971, Jerome has been buying and selling interesting and rare silver items, and has helped build important collections of southern silver for museums and for many private collections. Jerome is a native of Lexington, Kentucky, and he began a serious study of Kentucky and southern silver after his graduation from college in 1964. He joined the faculty of Kentucky Wesleyan College in 1969 and continued his interest in early silver, exhibiting at regional antique shows, and lecturing before various groups. He did considerable research on the silversmiths of western Kentucky and southern Indiana and was a major contributor to Silversmiths, Jewelers, Watch and Clock Makers of Kentucky (1980), authored by his friend, Marquis Boultinghouse. Jerome began working seriously on a similar book about the silversmiths and related tradesmen of Indiana. The book, Indiana Silversmiths, Clockmakers and Watchmakers, 1779-1900, was published in 1984. 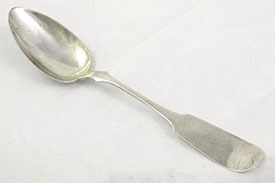 Later, he served as guest curator for an exhibition of Indiana Silver at the Indiana State Museum, which was the first major exhibit of Hoosier Silversmiths and Related Tradesmen. Jerome was a contributor to Dr. Caldwell’s book, Tennessee Silversmiths (1988), and has written several articles for Silver Magazine. More recently, he was the opening presenter for a seminar on Kentucky Silversmiths held in conjunction with an exhibition of Kentucky Silver, hosted by the Georgetown-Scott County Museum, being the largest exhibition of Kentucky Silver ever mounted. 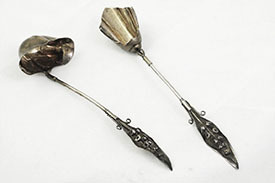 Jerome has seen many items from his collection exhibited at Silver in Kentucky Life, an important exhibition sponsored by Transylvania University in 1980, as well as a recent exhibition of Ohio Silver at Miami University of Oxford, Ohio. 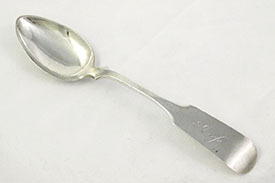 His collection of Indiana Silver was the centerpiece of the abovementioned exhibition of Hoosier Silver. As mentioned above, Jerome Redfearn has helped build collections for several museums, including The Filson Club (Louisville) Mud Island Mississippi River Museum (Memphis) Arkansas Territorial Restoration (Little Rock) Indiana State Museum (Indianapolis) Headley-Whitney Museum (Lexington) Museum Center (Maysville) Owensboro-Daviess County Museum, Georgetown-Scott County Museum, and many beginning and advanced collectors of Kentucky, Southern and Mid-Western Silver. Hopefully this website will be helpful to collectors, as we rediscover some of those long lost silversmiths and related tradesmen of the south and mid-west.